Nothing concentrates the mind more than discovering that someone was recently helicoptered off the very run you are about to tackle! A combination of strong winds and a rare rain storm on the Pic du Midi – high above the resort of La Mongie in the French Pyrenees – meant that the start of the ‘classic’ route had been sheet ice yesterday. One over-ambitious skier caught an edge right at the top and fell 200m down the corrugated ice, luckily saved by a slight ledge. His backpack ended up even further down, by the side of a frozen lake. Claude Etchelecou, my guide for the day (pictured above) wanted to check that conditions had improved well enough to ski today, so we would have to wait until later in the day to meet. When you’re in Grand Tourmalet having spare time on your hands is hardly a problem. I spent the morning taking the cable car up to the mid-station from where I headed skiers’ left to find myself in a gentle bowl of perfect powder. “Who needs the top?” I thought, “This is amazing!” And I carefully floated my way down another couple of bowls, before I reached the treeline, skipping in and out of the heavily laden trees, and finally followed a path until it joined the road to La Mongie near Artigues. It turned out that Grand Tourmalet organises an ad-hoc shuttle that runs the 6km back to resort from that very point. You register in true old-school style by writing your name on a sign-up sheet in the cable car base station. I didn’t find this out until I got back, but it also gave me the chance to be even more old-school and faire le stop (hitch) my way back to La Mongie. While on my way back up the hill, Claude rang. He’d tried the run and we were on: could I meet him at the bottom of the lift in 10 minutes? The timing was perfect and if the snow was anything like my first run, it would be one to remember. As memorable as the skiing would prove, the view itself from the Pic du Midi was outstanding. It’s a working observatory: the highest in Europe at 2877m. As well as hosting scientists and astronomers, there are rooms for up to 27 guests to stay each night, with the chance to see both sunrise and sunset over the mountains and to examine the skies with minimal light pollution. That evening I was lucky enough to stay there myself. While I found actually sleeping at almost 3000m above sea level to be challenging (apparently one in every two guests find it hard to sleep), the overall experience was still very satisfying. 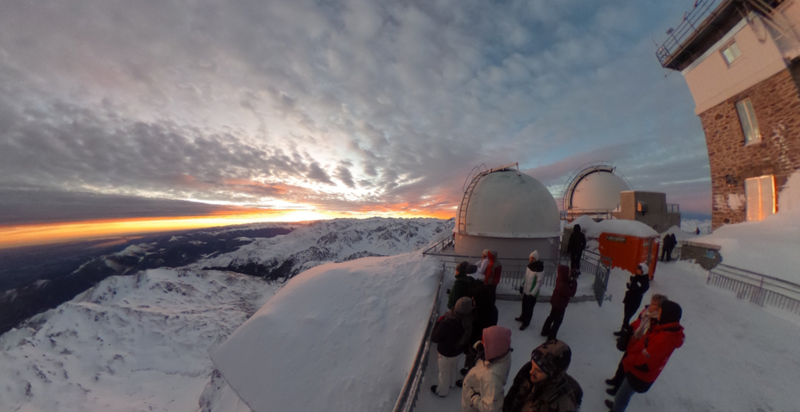 I was treated to a superb evening meal (with wine, if you wanted – although we were warned it has three times the effect at this altitude) and a guided tour of the night sky, first in their planetarium and then through a telescope. Watching the sun rise over the Pyrenees was phenomenal and something I’ll never forget. That was all to come. First, I had to conquer the descent on skis. That’s where Claude really came into his own. As the lead guide of Hors Pistes, he was one of the first to offer accompanied descents from the Pic. He pointed out the vertiginous north face – the Couloir des Poubelles – which he never skis until later in the season when it’s safer. We headed to the south-east side of the Pic, to take on the ‘classic’ route in the direction of Barèges. Once we’d negotiated a few hundred metres of unforgiving, rugged ice, the slope opened up and we skied through 15-20cm of light, fresh snow on a hard base. We paused to admire the original observatory, destroyed by an avalanche in the 19th century, then dropped down through another perfect and untouched powder field before traversing high above Lac d’Oncet. Now on the Barèges side of the Grand Tourmalet ski area, Claude pointed out the Col du Tourmalet to our left. This ridge marks the divide between Barèges and La Mongie, but is most famous as a hors catégorie climb in the Tour de France. On the way back later, we visited the restaurant on the col to admire the cycling memorabilia on the walls. The rest of our descent took in open, wide descents through glistening powder until we reached Super Barèges. My Garmin tracked the full run as 1500 very satisfying metres of vertical drop and 6.9 kilometres of turns without seeing a single other person along the way. The Pic du Midi is not the French Pyrenees equivalent of the Vallee Blanche – there’s fewer people and it’s less expensive. 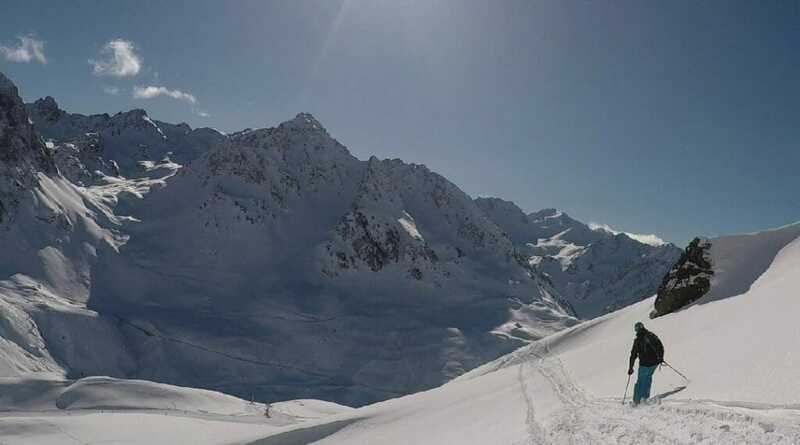 Grand Tourmalet offers a huge range of off-piste and backcountry options, without the crowds you find in the Alps. Given the right conditions and a good guide, I highly recommend it.